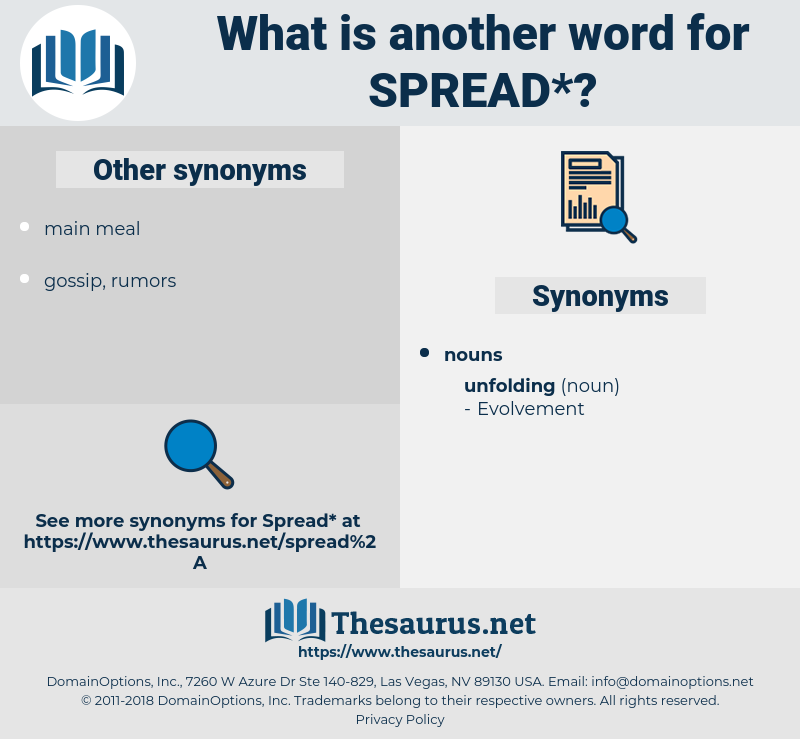 What is another word for spread? A table, as spread or furnished with a meal; hence, an entertainment of food; a feast. sprawl, generalization, pandemic, diversification, extent, universalization. Predominated, circulated, Encompassed, Progressed, Broadened, Popularized, shared, Spanned, spans, enlarged, developed, erupted, redeployed, Spilled, divided, Prevailed, rose, Passed, advanced, spent, Promoted, promulgated, Widened, apportioned, scrambled, swept, dominated, stretched, allocated, produced, removed, Reached, covered, elaborated, saved, Grew, enhanced, placed, conveyed, Carried, lying, Consisted, augmented, contracted, moved, rolled, aired, earned, shaved, Lasted, said, continued, played, Gained, Shipped, focused, Had, won, Went, Took, Met, made. circulated, separated, Replicated, redistributed, Broadened, represented, Interspersed, Popularized, shared, reproduced, plastered, Spanned, decentralised, presented, led, enlarged, practised, diversified, Disbursed, Forwarded, diffused, discarded, categorized, developed, encouraged, Caused, categorised, redeployed, randomized, spaced, Spilled, Transported, reallocated, Caught, prepared, publicised, decentralized, generalized, Delivered, divided, divides, generalised, spoken, Passed, Dispelled, publicized, organised, understood, Preached, spent, Attributed, Advocated, Generated, ordered, reported, Promoted, scaled, expressed, applied, distinguished, Widened, Arrived, apportioned, sent, disposed, implemented, acquired, partitioned, restored, phased, Prorated, Eliminated, Occurred, Resulted, afflicted, stretched, Communicated, subdivided, seeded, allocated, summarized, used, produced, structured, multiplied, removed, Awarded, arranged, reversed, risen, fragmented, Reached, affected, Excluded, covered, raised, Displayed, accomplished, organized, amortized, perceived, grown, broken, contained, elaborated, saved, classified, graduated, marginalized, strewn, Offered, replaced, unleashed, paved, enhanced, realized, portrayed, Averaged, sown, Liquidated, clustered, worn, isolated, impacted, infected, experienced, dissolved, assigned, balanced, disunited, laid, Introduced, Assessed, Created, inherited, relayed, mediated, disclosed, dismissed, calculated, established, realigned, included, Borne, Aggregated, placed, Referred, accepted, Avoided, conveyed, Been, Carried, Provided, opened, littered, Worked, augmented, paid, received, designed, Performed, Supplied, implied, contracted, scheduled, moved, Channelled, positioned, Housed, taught, rolled, situated, Returned, aired, earned, defined, renewed, located, Disbanded, Achieved, left, refined, budgeted, Accorded, struck, ignored, selected, allotted, engaged, lost, sequenced, completed, collected, directed, entrenched, granted, handed, attained, seen, planted, listed, Installed, shot, retained, sold, stored, conducted, CODED, Discounted, imported, rejected, Pooled, Believed, settled, found, known, played, admitted, Filed, Submitted, implanted, Gained, felt, Stationed, thrown, Shipped, dotted, fired, elected, based, Brought, maintained, Fitted, Launched, sorted, Shown, held, focused, won, grouped, Shifted, gone, touched, Omitted, done, taken, Met, given, made, broadcasted. circulate, popularize, broaden, publicise, propogate, enlarge, diversify, redistribute, generalize, generalise, sow, divulge, extent, encompass, promulgate, convey, popularise, stir. spreading, dissemination, proliferation, disseminating, disseminate. 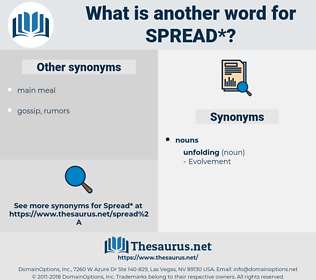 spreading, dissemination, proliferation, spillover, pervasiveness, spill-over, contagion, generalisation, epidemic, popularization, multiplication, incidence, disseminating, broadening, disseminate, expanse, widening, breadth, infection, penetration. dissemination, peddle, disseminate, wreak, flourish, allocate. abridgment, decrease, reduction, halt, compression, stop, extreme, suppression, stagnation. turn up, concentrated, unextended, unprepared. diminish, lower, lessen, abridge, reveal, end, straighten, narrow, hide, lose, collect, conceal, shrink, disorganize, block, shorten, close, compress, restrict, mix up, shrivel, confuse, contract, reduce. The other held his hand before me with the first two fingers spread wide apart. It also helps the paint to dry more quickly when spread on a house or bridge. shepherd, superhet, separate out, suppurate, separate, sprat, scabbard, spirit away, sprit, seaport, safe period, sobriety, sick berth, spirt, ship route, seaboard, Sauce Verte, subpart, spirit, sick parade, shoebird, seabird, spread head, sheep rot, sprout, sea bird, sybarite, supported, spread out, siegfried, shipboard duty, sporty, spurt, sparta, support, sprite, spreadhead, severed, sabre-toothed, sparid, spirited, shipyard, soubrette, savoyard, severity, superiority, sport, sabertoothed, sowbread, spearhead, saber-toothed, separated, subvert, spheroid, Sephardi, sabertooth, shipboard, soapwort, sprouted, sparidae, schubert, shepard, spread-out. invasion, diffusion, dispersion, scattering, irradiation, radiation. generalise, spread out, exfoliate, straggle, catch, propagate, sprawl, deploy, divaricate, spread, grass, uncross, slather, discharge, splay, metastasize, diffuse, straw, generalize, strew, export, metastasise, butterfly, redistribute, fan out.